A Serious Pie on Capitol Hill, new chapters for the Carmelita and Olivar spaces, and a pair of awesome new neon signs. 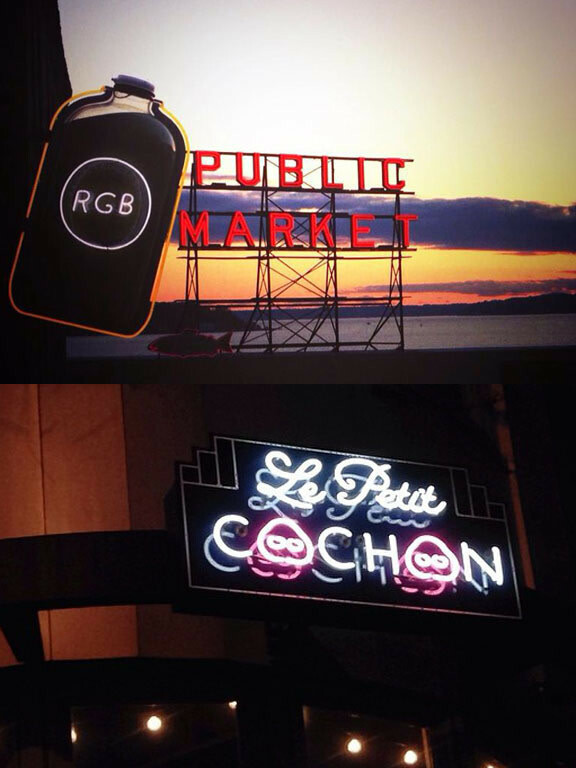 Rachel's Ginger Beer adds some neon to Pike Place Market, while Le Petit Cochon's twin snouts overlook Fremont Ave. Photos via the restaurants' Facebook pages. Former Kell’s Irish Pub bartender Joe Russell has officially opened his own pub and restaurant featuring the Northwest’s own Proletariat Wines on tap. Phinney Ridge's new Mexican spot in the former Carmelita loation is open for business, and Eater Seattle has photos of the artful 110-seat space. The partners are the same guys behind places like Nickerson Street Saloon, Martino's, Prost!, and Little Water Cantina. Capitol Hill is losing the popular restaurant after five years in the Loveless building on Roy Street, reports Eater Seattle. See below for details on its replacement, Restaurant Marron. Breakfast steak sandwiches, juices from Kirkland company Healthy Bonez, and "big, messy sandwiches" for lunch will be coming to Belltown as soon as owners Marcus Johnson and Jessica Gifford (of Rabbit Hole, Bathtub Gin, and Lava Lounge) can dry that last coat of paint, reports Eater Seattle. Craigslist suggests that the Hawaiian burger chain’s long-awaited Bothell location appears to be almost ready to join its Greenlake and Woodinville siblings in bringing island flavor to Seattle’s burger scene. The plans for the new Starbucks roastery going in on Capitol Hill include a third location of Tom Douglas's wood-fired pizza restaurant, according to Capitol Hill Seattle. It's destined for the former Utrecht art store location at Pike and Minor. The former Olivar will soon be home to 16-course tasting menus prepared by chef Eric Sakai, though he promises his restaurant will be the sort of place where you can dine in shorts and flip flops. Sakai's wife Zarina is also working on a wine program specifically tailored to fit the flavors of each unique meal. With its space on California Avenue transforming into townhomes, the Alki Italian joint will be temporarily operating out of Bamboo Grill’s kitchen by the beach during the search for a new home, notes West Seattle Blog. The former Gordon Ramsay understudy and executive chef at Sonoma Valley’s Kenwood Inn and Spa is bringing his talents to the Northwest, taking over as executive chef at Salish Lodge and Spa in Snoqualmie. The Seattle Times revealed that Julie and Ludger Szmania have sold Magnolia's much-loved German-toned steakhouse. The buyer: former Szmania's cook Michael Rogozinski and his wife Carolyn. The Szmanias will be operating Warm Springs Inn and Winery in Wenatchee while the Rogozinkis add their own touch, and eventually a new name, to the 23-year-old restaurant. The University Way expresso bar will be adding a second floor replete with a coffee education center, roaster, and more seating reports Eater Seattle. Sam Crannell is fooling around again this April. After turning his Queen Anne restaurant into a tapas spot last April 1, he’ll be bringing Mexican flair to the jokester’s holiday with a menu of tacos, ceviche, queso fundido, and more from 4 to 10 pm. When Pike Place Market lost its iconic Seattle’s Best Coffee sign last year, it left a void in photographs that went unfilled until the Market’s one and only ginger beer shop added this sign from Western Neon. In other sign-related news, Fremont got a little brighter this week as Chef Derek Romspies added twin pig snouts to the neighborhood’s, um, skyline.